Robotic automation industry is at the cusp of revolutionizing several industries, especially with the advent of internet connectivity. Modern industrial robots that are being created to assist man in labor are nothing short of engineering marvels. The robotics industry is thriving with cutting edge solutions and services. 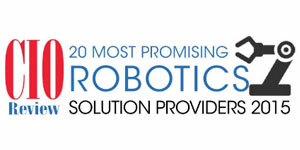 Here are 20 Most Promising Robotics Automation Solution Providers 2015. 5D Robotics Leveraging a cross-platform, and a plug-and-play solution for responsive robotic behaviors and intuitive human interaction. Adept Technology Delivers solutions that give clients economic value throughout the production lifecycle, enabling customers to achieve precision, quality, and productivity in their assembly, handling, and packaging processes. Aethon Aethon manages internal logistics using an autonomous mobile robot to deliver and transport materials through a variety of organizations including hospitals, manufacturing environments and distribution environments. Applied Manufacturing Technologies Delivers automation robotics technologies with a depth of knowledge and experience that exists solely to add value to customers’ performance. Autonomous Solutions Designs and manufactures unmanned vehicle systems, software, and components for a variety of industrial, agricultural, automotive proving ground, and military customers. Enterprise Integration Revolutionizing the technique of augmenting digital robotics standards with robust, user-friendly solutions, and products. FANUC America Corporation Offers a wide range of industry-leading products and services for robotics, CNC systems, and factory automation solutions. Gallop Solutions A firm that provides specialized colocated software testing services to businesses in North America. iRobot iRobot’s home robots are revolutionizing the way people clean – inside and out. Kepware Technologies Provides software solutions to aid businesses connect diverse automation devices and software applications. The firm serves a wide range of customers in a variety of international vertical markets including Manufacturing, Oil & Gas, Building Automation, Power Distribution, and more. Liquid Robotics The firm deploys fleets of networked, wave-powered ocean robots, solving critical problems for its defense, oil & gas, commercial, and science customers. MTAB USA Provides simulation solutions in the areas of skill development and special machine solution. NewBotic A firm that helps develop new manufacturing process automation, industrial application, and robotic operations throughout the Northeast U.S.
Penguin Automated Systems Inc Providing professional and comprehensive robotic and automation solutions for underground, underwater, in-space and on-surface applications. Qbotix Providing professional and comprehensive robotic and automation solutions for underground, underwater, in-space and on-surface applications. Quanergy Systems Delivers robust and intelligent real-time 3D mapping and object detection,tracking, identification, and classification. R&E Automated The company is an internationally recognized leader in the automation, engineering, and prototype build industry. R&E is able to accommodate specific challenges by designing and programming turnkey automation systems for a variety of manufacturing applications. Rethink Robotics The firm introduces robotics into processes that manufacturers have never been able to cost-effectively automate before. Robotmaster Jabez Technologies Provides robot programming technologies that enable versatile and profitable robotic solutions for industrial manufacturing applications.